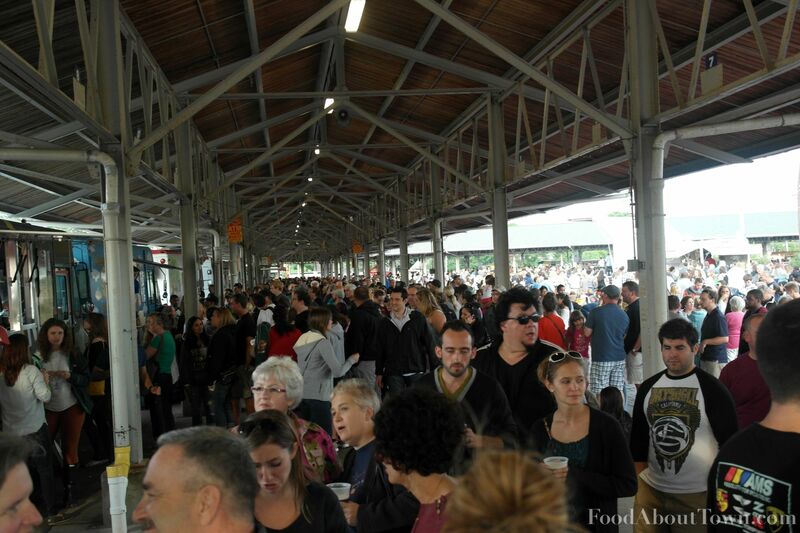 Another month, another Food Truck Rodeo at the Public Market! As always I’ll be recapping any new trucks that pop up, reviews of dishes I sampled and my overall thoughts about this month’s event in the normal format below. 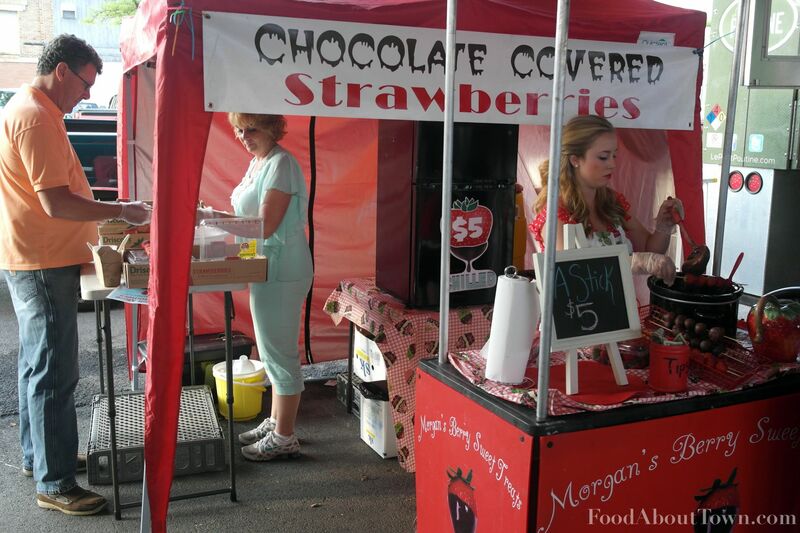 The only new vendor I noticed this month was a small chocolate covered strawberry stand called Morgan’s Berry Sweet Treats down near the end of the shed near Lettuce B Frank. Their sole product was a stick full of five coated Driscolls berries for $5. Do with that what you will! Thankfully I dragged a work associate along with me to split up some dishes because our main target for the evening were two of the newer powerful meat sandwiches from the Marty’s Meats truck; the porchetta and the pastrami. I know I end up eating from them during a lot of the rodeos, but they are one of the few trucks that consistently delivers new and interesting products and that keeps things interesting. A top notch sandwich is hard to come by in Rochester and Marty’s pastrami with whole grain mustard and sauerkraut fits the bill. 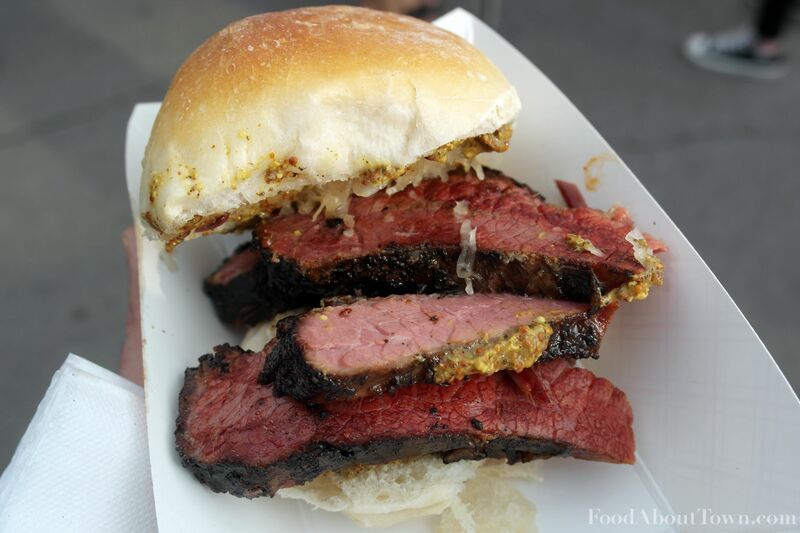 They cure and smoke their own brisket to make the pastrami and it really shows in the tender, fatty, thick slices of meat with solid and well seasoned bark. Pepper and coriander were evident and after a chat with Marty himself he informed me that they even spiked the mustard with coriander to amplify the taste. The meat wasn’t overcured, had a great strong smoky taste and the acidic accoutrements were a perfect foil to the richness. Truly one of the best sandwiches in the whole city and their stuff is only getting better over time. Very impressive! 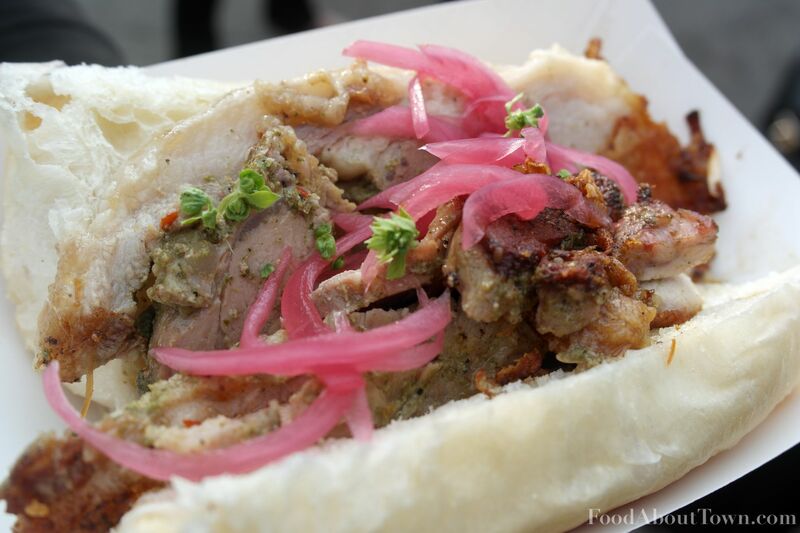 We also had the chance to try out the porchetta sandwich which consisted of roasted pork shoulder, shards of crispy skin, herbs and pickled onions on a small sub roll. The pork was highly fatty, tender and quite tasty, but could have used a touch more salt and herbs to help cut the richness of the meat. The pickled onions cut through nicely and the crunchy skin gave some needed texture to the sandwich. Thankfully the sub roll was dense and a bit crusty to withstand the onslaught of pork drippings. Mmmmmm…..pork drippings. A solid, tasty sandwich that would rank highly at most places, although one that doesn’t quite measure up to the fantastic pastrami or the Frisket loaded with BBQ brisket. On another cool note, Southern Exposure Farms, the organic rooftop farm run in part by the Marty’s Crew, was selling some of their beautiful peppers and tomatoes at the truck as well. Next time you see their food on a menu or for sale, you should definitely grab some. I’ve been very impressed by the quality and variety I’ve seen so far. To finish things off on a lighter note, I introduced my compatriot to the Lettuce B Frank cart which continues to be one of my favorite stops either at the rodeo, at their new home at 3 Brothers Winery or at the Brighton Market on Sunday mornings. 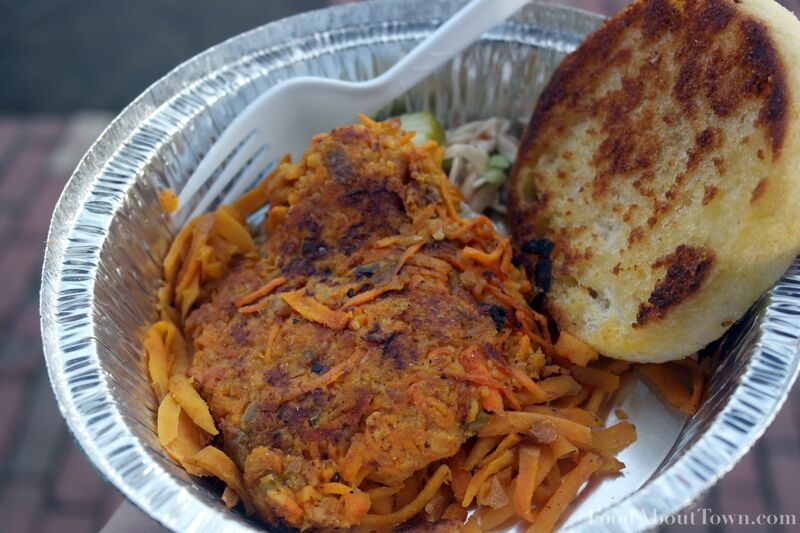 We dove into a carrot slider plate that came with their now standard sweet potato hash seasoned with rosemary, coleslaw, pickle and a toasted half of a Wolferman’s english muffin. The slider was well seasoned and full flavored as usual and a great, real food option for those that don’t want to eat meat. You never feel like you’re eating less than with the options at LBF. Crazy busy. That is the best way to wrap this one up. We weren’t able to sample some of the other big vendors due to their extraordinary lines, some of which were reaching back as far as I’ve ever seen them. Special dishes sold out early at The Meatball Truck and the Le Petit Poutine truck had to have had 20-30 min wait for 2+ hours easy. We were treated to some of the best sandwiches Rochester has to offer from Marty’s Meats and walked away truly satisfied after capping things off at my friends at Lettuce B Frank. If you still haven’t come out to the Rodeo yet make sure to get there early, beat the lines and see what you’ve been missing in the world of portable food vending.